Grove, who became CEO of the Santa Clara-based firm at the age of 52, was a tech pioneer pivotal in the launch of Intel in 1965. He later helped reposition the company from memory to processor chips. Born András Gróf in Budapest, Hungary, Grove immigrated to the United States in 1956-57 after having survived Nazi occupation and escaping Soviet repression. He studied chemical engineering at the City College of New York, completing his Ph.D. at the University of California at Berkeley in 1963. After graduation, he was hired by Gordon Moore, who coined “Moore’s Law,” at Fairchild Semiconductor as a researcher, and rose to assistant head of R&D under Moore. When Noyce and Moore left Fairchild to found Intel in 1968, Grove was their first hire. Grove became Intel’s President in 1979 and CEO in 1987. He served as Chairman of the Board from 1997 to 2005. 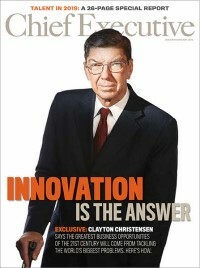 He was “an influential, outspoken industry figure” who “gives new meaning to the phrase hands-on manager,” Chief Executive magazine wrote about the larger-than-life figure in November 1987. Back then, after being bloodied by the worst slump in its history, Grove said that U.S. semiconductor makers would have to be “agile giants” and pugnacious protectors of their technology. He clearly served in this role throughout his entire career at Intel. Grove’s legacy of leadership will surely live on for many years to come.